I'm planning on making some homemade yogurt this week. I have about a ton of frozen bananas in my freezer that I need to use up and we like to make yogurt smoothies with them. I whipped up a fresh batch of Russian Friendship Tea and I've got some homegrown rhubarb in my freezer just screaming to be made into a pie. Would you like to share your shopping trip success with the rest of us? 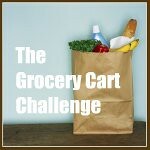 Please link directly to your post, not your homepage, and please include a link back to The Grocery Cart Challenge. OK so I have a silly question. I froze some bananas to use later, but I wasn't exactly sure how to go about defrosting them. Or do you just used them frozen in smoothies. I was hoping to use them for bread/muffins. 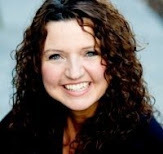 I have been following your blog for a while now. I was curious as to why you don't make your own bread? I am working on getting my grocery budget down, I will probably never be as low as you since my kids have a lot of food allergies and all the specialty foods and ingredients cost extra. But one way I have been able to bring it down is by making my own bread and bread products. Just curious. When you buy in bulk do you put them in containers when you get home or do you just use it in the bag? I don't own a lot of tupperware type stuff so I am always passing by the bulk bins. I usually always try and find a cheap store brand instead. I store the bulk items in glass mason jars. Then I put sticky address labels on the sides with the name of what's in the jar so I can keep track. I do make some of our bread...like rolls, and artisan loaves. But we don't like the way homemade bread slices into sandwich slices so we prefer to buy that at discount. For smoothies I skip the ice cubes (used to thicken) and just use the frozen bananas. For baking I would microwave to thaw (they aren't going to look pretty) and then add to the recipe as called for. THANK YOU so much for this blog and for your inspiration!! I see that you bought some foil pans this week for food gifts. Do you have any recipes to share that can be used for food gifts, easily frozen, frugal and yet yummy??? I often want to bring a dish to a family or friend in need and find myself either ordering them takeout or getting frustrated and not taking anything at all! I would love to have one or two staple meals that I know won't break our budget and are easy to put together that I could take to friends and family. You inspire me every week to do better with my grocery shopping! THank you! I just awarded you with the Best Blog Award. Click over to the link for instructions on how to accept this award.